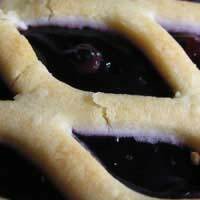 If you are a fan of good solid desserts then sugar free pies should certainly top the list of your preferred recipes. Nothing beats a golden shortcrust pastry full of bubbling fruit flavour.People panic about making pastry but it really is very simple - and in opting for homemade rather than shop bought, you’ll certainly notice the difference.If time is an issue, however, don’t worry, ready-made will do. And you won’t find it difficult to find a sugar free shortcrust in the freezer section of your local supermarket. Simply rustle up a delicious sugar free fresh berry filling - as detailed below - and roll out either your own or your shop bought pastry. Serve your pie with sugar free custard or cream and you’ll have your guests clamouring for more. A true autumnal dish, pick your own fresh blackberries when they are plump and ripe. Combine them with your favourite cooking apple for a distinct and delicious flavour. Place your margarine in a medium bowl, gently fork in one tbs plain flour and one tbs cold water. Mix until you have a paste. Slowly add the rest of your flour until you have a pastry-like dough. Wrap in cling film and place in the fridge to chill for about an hour. Preheat your oven to 200 deg C/400 deg F/gas mark 6. Wash and prepare your blackberries and cooking apples, ensuring you have no bits of leaf or stalk in with the fruit. Core and peel the apples. Place the fruit in a large saucepan with your cinnamon apple juice and sugar free jam. Stir well then heat gently, continuing to stir all the time. Allow to reach the boil then simmer gently for five minutes. Roll out your pastry and carefully line a greased pie dish. Bake blind for five minutes before filling with your topping. Roll out the rest of your pastry. Lift and cover the fruit. Trim the edges and place in the centre of your oven. Bake for about 20 minutes or until your pastry is crusty and golden brown. Serve with sugar free custard. Gooseberries are not to everyone’s taste but if you enjoy tart flavours, you’ll love this dish. This time sweeten your dish using a little grape juice and honey. Once again, place your margarine in a medium bowl, gently fork in one tbs plain flour and one tbs cold water. Mix until you have a paste. Slowly add the rest of your flour until you have a pastry-like dough. Wrap in cling film and place in the fridge to chill for about an hour. Preheat your oven to 200 deg C/400 deg F/gas mark 6. Wash your gooseberries and remove any stalk. Place in a medium pan with your honey and white grape juice. Stir over a low heat until the honey is dissolved. Then bring to the boil and simmer until the gooseberries are soft. Roll out your pastry and carefully line a greased pie dish. Bake blind for five minutes before filling with your topping. Roll out the rest of your pastry. Lift and cover the fruit. Trim the edges and place in the centre of your oven. Bake for about 20 minutes or until your pastry is crusty and golden brown. Serve with sugar free vanilla ice cream or clotted cream.